Stockings filled with little gifts and candy are one of my all time favorite Christmas traditions. There is just something special about a bunch of little gifts and favorite candies that have been hand picked and put in a stocking. Stockings for girls would be fun, but I'm a boy mama. I put together a list of fun ideas for a little boy's stockings. My boys are 11 and 6 years old, and would both be excited to get any combination of these items. I normally go pretty heavy on the candy, but that part is usually pretty easy to figure out. Today I am focusing on all the other stuff. I have posted links (NOT referral links or sponsored) to find these exact items on Amazon with prices for your convenience. Many of these items can be picked up for a lot less money. This is just to give you ideas. I didn't include this in the round up, but another tip is to go to Harbor Freight if you have one that is local. They always have lots of fun little inexpensive tools and gadgets that would fill a stocking nicely. 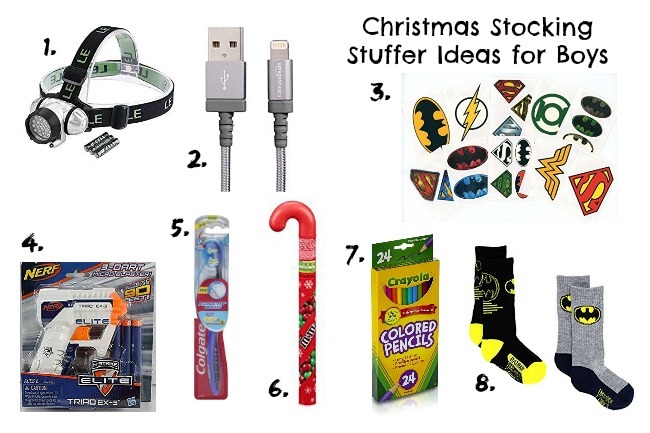 What kind of items do you like to fill stockings with?